Rogers Lake, its basin spanning over one mile across, is located in the Upper Verde watershed and is a regionally significant, high-elevation wetland important to numerous wildlife species. 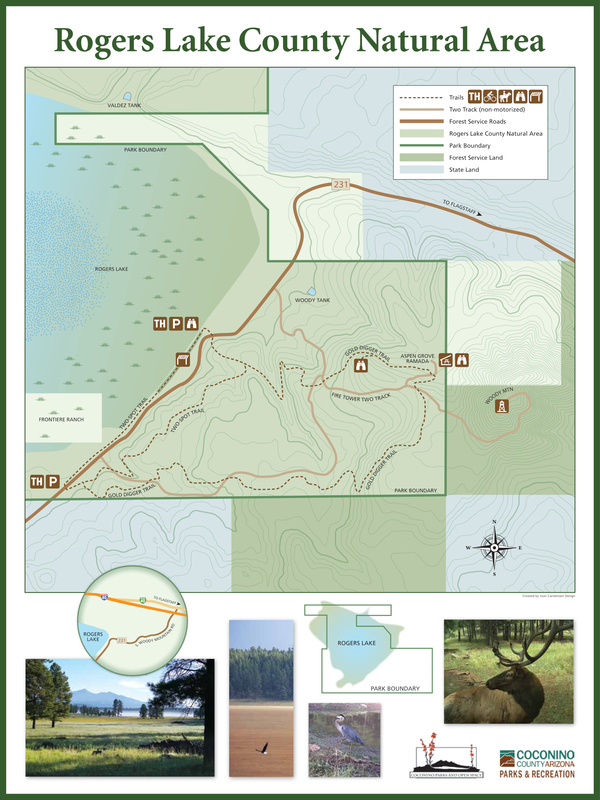 In 2010, Coconino County aquired the land of Roger's lake, and nearby land at the base of woody mountain and it is now known as the Rogers Lake County Natural Area. There are two small trailheads with parking areas off Woody Mountain Road for the natural area, to access two multi-use trails. 2-Spot Trail is a loop trail that connects both trailheads along the shore of the lake (note lake is dry depending on time of year) The upper part of the loop runs along the base of Woody Mountain. The trail and both trail heads are well marked. The trail also connects to the longer Gold Digger trail that goes further up Woody Mountain. The trail is multi-use. The lower part of the loop is supposed to be excellent for wildlife viewing and also provides views of the San Francisco Peaks.